US lawmakers visiting Israel as part of a fact-finding mission this week expressed their support for Israeli sovereignty over Judea and Samaria, adding that they believed many local Arabs would embrace the application of Israeli law over the area. Congressmen Scott Tipton, a Republican who represents Colorado’s 3rd congressional district in the US House of Representatives, and David McKinley, a Republican representing West Virginia’s 1st district, are currently visiting the Jewish state as part of a mission facilitated by Jaffe Strategies and sponsored by Proclaiming Justice to the Nations, a US-based pro-Israel Evangelical organization. On Sunday, the two Republican lawmakers visited the town of Rehelim, south of Ariel, in Samaria. 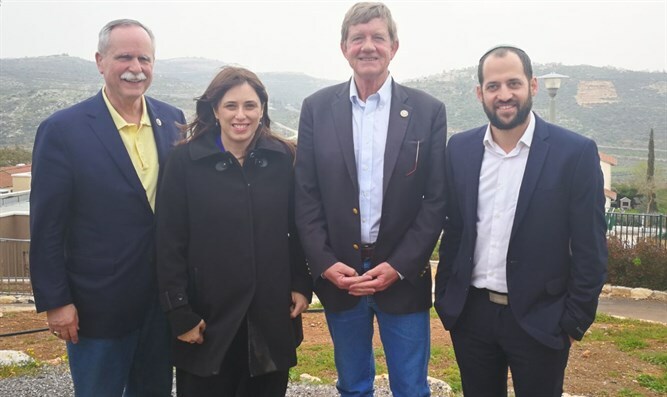 Following a tour led by Deputy Foreign Minister Tzipi Hotovely (Likud), the Republican lawmakers expressed their support for the so-called “Sovereignty Movement”, which seeks to apply Israeli sovereignty over Judea and Samaria. Congressman McKinley emphasized the importance of respecting Israeli sovereignty, and allowing Israeli voters to decide questions regarding the final status of Judea and Samaria. "I think it’s important that we also give and respect the right of the Israeli people to make their own choice in what should happen in all parts of their destiny,” said McKinley, “to be able to defend their borders, to choose the laws... whether that be with the Temple Mount, or Samaria and Judea, we all need to be working together." Representative Tipton said the delegation met with local Arabs he claimed who backed the application of Israeli sovereignty, and spoke of the “importance” of having Judea and Samaria unified under “one state” with the rest of Israel. "I think with the moving of our embassy over to Jerusalem we're going to see positive things moving forward."